Some animal characters have a tuft of fur or feathers on their heads to make them stand out more. This can be used to make the animal look like it has hair, simply to distinguish it against other individuals without giving it an accessory to wear, or to just break up what could be an otherwise plain silhouette. The tuft of fur or feathers can take the form of a cowlick, a feather crest, a stylish curl, messy fuzz or set of tufts, a few or a set of spiky tufts, or a shock that sticks out as well as a simple tuft. The tuft can either be small, medium, or large. The tuft is most frequently placed on the top of the head, but it can also be placed on the back of the head. A majority of head tufts on fictional animals point toward the forehead and face, but some can point away from the face and grow more with the general fur or feather growth. Some fur and feather tufts are reminiscent of Idiot Hair, Messy Hair, or Wild Hair and some fur and feather tufts can behave like Stubborn Hair. When it comes to Funny Animal and Petting Zoo Person characters this is much more common in males to the point of being a Tertiary Sexual Characteristic. Female characters will usually have a Furry Female Mane while males only have a small amount of fluff. With Nearly Normal Animal and Partially Civilized Animal characters the opposite is usually true. Female characters are more likely to have tufts of fur to establish them as females while males are normal and "bald". However, in the case of a Messy Male, Fancy Female pairing, the male animal might have a tuft while the female has smooth fur. Compare to Non-Mammalian Hair and contrast with Furry Female Mane. Ritchie had a Pikachu named "Sparky" who had a tuft of fur to distinguish him from Ash's Pikachu. In "Battling At Full Volume" a guitarist trainer with a mohawk exclusively battled powerful Pikachu. His Pikachu had his fur styled like a fauxhawk. While Warrior Cats fanart commonly depicts cats with this, it's used rarely and very subtly in the Warrior Cats (manga) themselves. Tufts of fur are used to distinguish characters in the Shogakukan Sonic the Hedgehog manga. For example, Nikki's parents have tufts of fur on their head, his little sister doesn't, and Nikki himself has blue hair. Bunnie from Archie Comics' Sonic the Hedgehog started out with fur on her head but eventually she was redesigned to have a full head of hair. Warriors fan-artist Draikinator has a few MAPs that are themed around giving the normally realistic cat characters "out there" designs (based on how many 2000s-era artists drew the characters), including inaccurate colors and long tufts of head fur. This Jayfeather MAP set to Evanescence's "Everybody's Fool" has Jayfeather with a "emo" Peek-a-Bangs. In Rudolph the Red-Nosed Reindeer (1998) bucks like Rudolph and Arrow have fur on their heads while does like Zoey don't. Most of the mice in The Secret Of Nimh have tufts of fur on their head, which they don't have in the original book. Minnie Mouse in Mickey, Donald, Goofy: The Three Musketeers has a tuft of fur on her head. Mickey Mouse does not. Minnie averts this in almost every other appearance though. The male ducks in Leafie, a Hen into the Wild have fluffy head feathers that look like hair. Wanderer is particularly memetic to the point where the movie is called "that movie with the bishonen ducks". In Rio both macaws and toucans are designed with a crest of feathers on their head that varies in size and shape, to give the individual characters more distinct appearances. Taken to the extreme with Roberto in the sequel, whose crest makes him look like a Long-Haired Pretty Boy with Non-Mammalian Hair. Oliver (the protagonist) and Rita (The Chick) from Oliver & Company have tufts of fur on their head, with the latter looking very much like she has '80s Hair. Subverted with Tito, who inexplicably has red hair on his head despite being a normal looking Chihuahua. Stitch of Lilo & Stitch has a small tuft of fur on his head. Figaro the kitten in Pinocchio has a tuft of fur on the back of his head. Gideon the adult cat in the same movie has a thin, messy tuft of fur that sticks forward on his head. Both feline main characters from Cats Don't Dance have a significant amount of fur atop their heads. Orange tabby tom Danny has the standard tuft that even his straw hat can't contain, while pretty angora kitty Sawyer likes to curl hers into a stylish swirl. Being the main characters, theirs are the most prominent of all the anthropomorphic characters in-universe. The Bambi series uses the Messy Male, Fancy Female trope. Bucks like Ronno and Bambi are fluffy and have fur tufts while females like Faline have neat fur. The Fox and the Hound features Messy Male, Fancy Female. Despite Todd being a former pet and Vixey being wild, Todd is drawn as having unruly fur (including a tuft of head fur) while Vixey is well-groomed. Angel has a tuft of fur on her head to help distinguish her as female. Scamp's tuft of fur emphasises his youth and distinguish him more from his father. Simba himself has a bit of messy fur on his head. It's not as pronounced as with other cubs, however it is noticeable when compared to Nala's tidy fur. Vitani from The Lion King II: Simba's Pride has a tuft of fur on her head. In her case it makes her look scruffy, befitting for an Outsider and a Dark Action Girl. Both of Simba's sons, Kopa from The Lion King: Six New Adventures books and Kion from The Lion Guard cartoon, have small manes growing in order to lessen the Strong Family Resemblance between them and their father as a cub. Tiifu and Zuri from The Lion Guard have a cowlick and a fluff of fur on their head respectively. Canon Foreigner cubs from the comics usually have tufts of fur. Tojo and Tama have tufts of fur while Malka has a small black mane. Timon's mother in The Lion King 1½ has a red tuft of fur on her head, like her son. She's the only meerkat with an eye color (instead of having Black Bead Eyes). Ma is a Significant Green-Eyed Redhead. Zazu's unnamed girlfriend in the comic Zazu the Heartbreaker has a huge head of feathers. The Lion Guard has a few non-lion examples. The gorilla princes have fur on their head styled like hair and Besthe the hippo has a small spike of black fur on his head. Toulouse and Berlioz have a messy tuft of fur on their heads. Marie has a tuft of fur held up by a pink bow on her head. Thomas OMalley the alley cat has a thin tuft of fur on his head. Duchess the high society rich female cat averts this to keep with her well-groomed look. Olivia Flaversham has a tuft of fur on her head. Basil has a messy tuft of fur on his head that can be seen when he is not wearing his deerstalker cap. Miss Kitty (who is a mouse) has a styled tuft of fur on her head. Felicia the cat has a tuft of fur held up by a bow on her head. Toby the dog has two short hairs sticking out on his head. In Who Framed Roger Rabbit Roger Rabbit has a large tuft of red hair on his head that is different from the white fur over the rest of his body. The male Velociraptor leader in Jurassic Park 3 has a crest of quills on his head to distinguish him from the other raptors. Notably, this is the only time in the whole Jurassic Park franchise that the raptors have been portrayed with any sort of feathers. 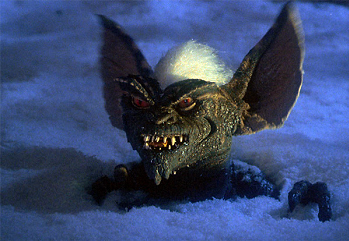 The page image is Stripe from Gremlins, whose tuft of white fur marked him as the ringleader of the evil Gremlins and as Gizmo's arch-rival. Among the rabbits of Watership Down, Bigwig is distinguished by being The Big Guy and by a pronounced tuft of fur atop his head, hence his name: Thlayli ("furhead") in lapine. The golden eagle on the Mexican flag has three spiky tufts of feathers on the back of its head. In Kingdom Hearts 3D: Dream Drop Distance Minnie has a tuft of fur when shown as the princess to the Country of the Musketeers. This is a direct reference to her design in the above-mentioned film, Mickey, Donald, Goofy: The Three Musketeers. Present-time Minnie in other Kingdom Hearts games doesn't have a tuft of fur. Some Animal Crossing villagers, such as Molly the duck, have tufts of fur or feathers instead of hair. Tails has an Anime Hair-esque tuft on his head. Cream's mother Vanilla has a tuft of red fur on her head, where Cream's mark is. Cream herself has no tuft. As part of Character Customization, players can choose to have tufts of fur on their lion's heads in as opposed to full manes or maneless heads in Impressive Title. In Feral Heart, the tufts extend to canine or at least non-feline characters to make them stand out more. There is a trend in the Furry Fandom to draw long, exaggerated hair tufts that look a bit like scene hair. You'll see this often in fan-art for series like Warrior Cats or Pokémon. Even if they're not exaggerated, tufts of head fur are extremely common on feral fursonas and OCs. The titular chipmunks in Alvin and the Chipmunks traditionally have fur on their head that looks a bit like hair, though Alvinnn And The Chipmunks gives them hair. In contrast, their Distaff Counterparts The Chipettes have Furry Female Manes. Harvey from Harvey Beaks has a fluff of feathers on his head that makes it clear that he is feathered instead of blue skinned. His mother has a full head of hair. Rita has a tuft of grey fur. In comparison, the male Runt is the one with the head of hair on his head. Slappy and Skippy Squirrel each have a tuft of fur on their head. The former wears a hat, so her head tuft is not usually seen. Pinky the mouse has a tuft of fur on their head whereas The Brain doesn't. In Pinky's case, the tuft makes him look funnier, while Brain's lack of tuft makes him look bald, and thus both more serious and more villainous. Billie the mouse has a large shock of fur on the top of her head. Wakko is shown to have a tuft of fur on his head when his hat is off. His older brother, Yakko, averts this. Fifi La Fume has a large light purple tuft of fur that is styled into a curl. Buster Bunny has a tuft of fur on his head. Babs Bunny has the same kind of tuft on her forehead as Buster. Furrball has a tuft of fur on his forehead, along with an Ear Notch and a bandage on his tail to reflect that he is a stray cat. Plucky Duck has a tuft of feathers on his head. Baby Plucky similarly has a tuft of feathers on his head. Boo Boo from Yogi Bear has this. Lola Bunny has something between this and a Furry Female Mane. She has blonde fur on her head that is a different shade from the rest of fur but it isn't a full head of hair. Bugs Bunny plays this straighter by having a simple tuft of fur on his head. Daffy Duck has a tuft of feathers on his head. Sylvester has a long thin tuft of fur on his head. Tweety has three long hairlike feathers on his head. Wile E. Coyote has a tuft of fur on his head and the Roadrunner has a very large tuft of feathers on his head. Speedy Gonzales is a light brown mouse with a black hairlike tuft of fur on his head. Taz has rather thick head fluff. Itchy the mouse has a simple tuft of hair on his head and Scratchy the cat has three spiky tufts on his head. The titular cat and mouse both have a thin tuft of hair on their head. Shaun the Sheep: While the rest of the sheep on the show have completely black heads, the titular Shaun has a tuft of white wool on his. Sassy Cat from The Grim Adventures of Billy & Mandy is a mix of Hello Kitty and Mickey Mouse. She has fluff on her head. Goofy has a long, very thin tuft of hair on his head. His son, Max has a large hair-like tuft of fur on his head. Pete has a tuft of hair on his head. Donald has a few tufts of feathers on his head, a main on on top of his head and one on the back of his head. Huey, Dewey, Louie, and Scrooge have feather tufts on their heads. Dale has a tuft of fur on his head, whereas Chip doesn't. The animated adaptation of Ratha's Creature gives the protagonist, Ratha, a tuft of fur on her head. Most of the others don't have the extra head fluff. Teenage Po is depicted with a tuft of fur on his head in Kung Fu Panda: Secrets of the Scroll. His adult form lacks it. Care Bears usually averts this trope however the redesigns for Care Bears: Adventures in Care-a-Lot uses this. Male characters have tufts of fur on their head while female ones have their tufts supported by ribbons. The Tertiary Sexual Characteristics at least meant there was no chance of Viewer Gender Confusion and Ambiguous Gender like in previous series'. The tufts of fur were abandoned in the next retool, and the characters went back to their traditional styles.